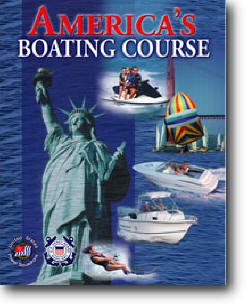 If you are interested in an exciting, in-depth boating safety course, check out America's Boating Course. America's Boating Course can be taken in any of three ways: on the Internet, by studying an 80-page course manual or with a CD. No matter how you like to learn, when you sign up you'll receive a complete package which includes the course manual, the boating course CD, and a PIN number giving you access to the Internet course. The course manual, CD and online course contain identical material, except for your state-specific law, which can only be accessed online. This boat safety course is fun and very thorough. Trailering, Storing and Protecting Your Boat: types of trailers; trailer brakes, lights, hitches, tires, and bearings; loading, balancing, and towing a trailer; towing (and backing) a trailer; boat launching and retrieving; boat storage and theft protection; launching, retrieving and storing a PWC.